PowerScore's LSAT Logic Games: Game Type Training II publication provides you with the complete text of every LSAT Logic Game from LSAT PrepTests 21 through 40. 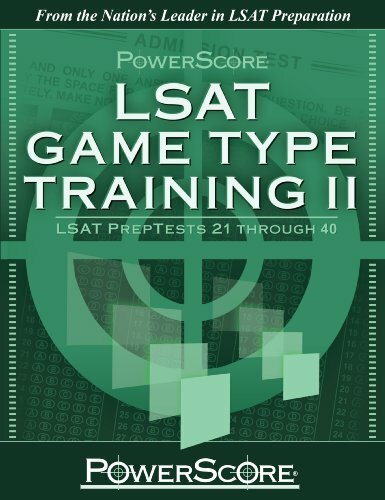 Containing 80 different games, including hard-to-find games from the early PrepTests, this book is an ideal training tool to increase your LSAT Logic Games score. The games are arranged in groups according to the games classification system used in the renowned PowerScore LSAT Logic Games Bible and are presented in the same order for easy cross-reference (for example, Grouping Games are covered in Chapter Four of this book and in Chapter Four of the Logic Games Bible). Grouping the games by classification provides practice with specific types of games, allowing particular focus on the game types you find most challenging. By examining games with certain basic similarities, you can analyze the features of each game type in order to better understand how games are constructed, how they can be most easily recognized, and how they can best be solved. This is especially the case if you have already read the PowerScore LSAT Logic Games Bible. Alternatively, for more general practice with games of all types, you can use the appendix in the back of the book and do complete game sections from individual tests. At the end of the book a complete answer key is provided; however, no setups or explanations are given. The 80 games in this book are an ideal supplement to the LSAT Logic Games Bible, LSAT Logic Games Bible Workbook, and LSAT Game Type Training I. However, even if you have not read these publications, this book provides an excellent practice resource, allowing you to develop your familiarity with various game types and with the Logic Games section in general. PowerScore offers comprehensive LSAT, GMAT, GRE, SAT, and ACT live and online preparation classes. For more information about PowerScore's publications or services, please visit PowerScore.com or contact PowerScore at (800) 545-1750.